If you walk one of them, you'll understand the real life of this ancient city. Enjoy the most beautiful parts of Kyoto with our private tour! 1,001 golden Buddhism statues are awaiting you. The main hall in on the hilltop, looking down the gardens and the Kyoto city far below. 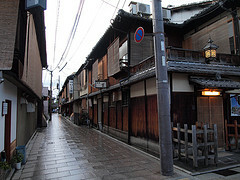 THe most traditional wooden houses are preserved here. Shogun's caslte in the Edo period, famous with is architecture and wall paintings. One of the most important Japanese shrines, dedicated to Japanese emperors' ancestors.